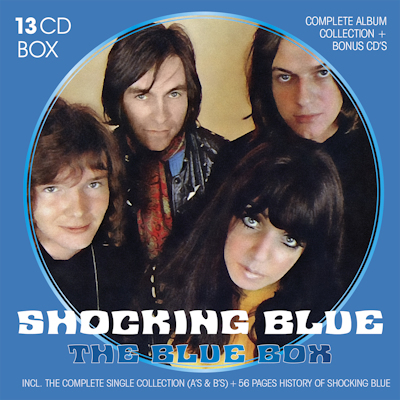 De langverwachte album collectie van Shocking Blue – The Blue Box!! All albums in this CD box are the original Dutch Shocking Blue album releases from the sixties and seventies, housed in their original covers and with original artwork, representing the band at the time. For a long time Shocking Blue was believed only to be a hit singles band but their albums have well proven to stand the test of time, not only in the Netherlands but also internationally. So here they are! Nine studio albums, a live album, a comprehensive compilation album and a bonus CD. Enjoy Shocking Blue’s music at its heyday and after!